Featured above is Awake At Last newest music video for their song “King Of The World”. Give it a listen, and be sure to keep up with them on all social media platforms if you like what you hear. 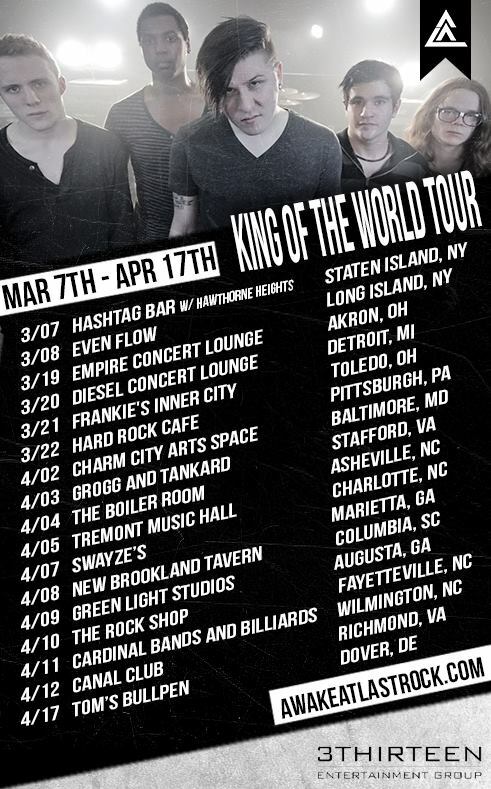 Awake At Last’s ” King Of The World” tour starts this Saturday March 7th at the Hashtag Bar w/ Hawthorne Heights. Part 1 of 4 of our acoustic sessions with My Own Hero. My Own Hero is a Staten Island NY based 4 piece pop punk band. Catch the second half of Tori’s tour through to the 23rd. Keep This Quiet is a four piece pop/rock group from New Jersey just getting started. FREE download of their “A Thousand Miles” cover available now. Just go to their facebook page, click the band page tab, and click download. Debut single coming November 23rd!